Please join me in thanking Florida’s teachers for the impacts they’ve made in each of our lives. Consider thanking an educator who helped or inspired you or your child along life’s road. Personally, I’d like to thank my mom, who inspired me to go into the field of education. As a kindergarten teacher, mentor, education coordinator for Head Start and associate professor in early childhood education, my mom has made a tremendous impact in the field of primary education in particular. We are turning things around in Florida with the help of teachers. In fact, Florida has gone from the bottom to the top of national achievement rankings, and between 1992 and 2011, our fourth-grade students doubled the national increase in students scoring at the highest levels of reading proficiency. Graduation rates for all students have also improved – by a whopping 20% since 1998. We’re miles ahead of where we’ve been, and we have teachers like my mother to thank. Think of a current or former teacher you’d like to thank. Who would it be, and what would you say? 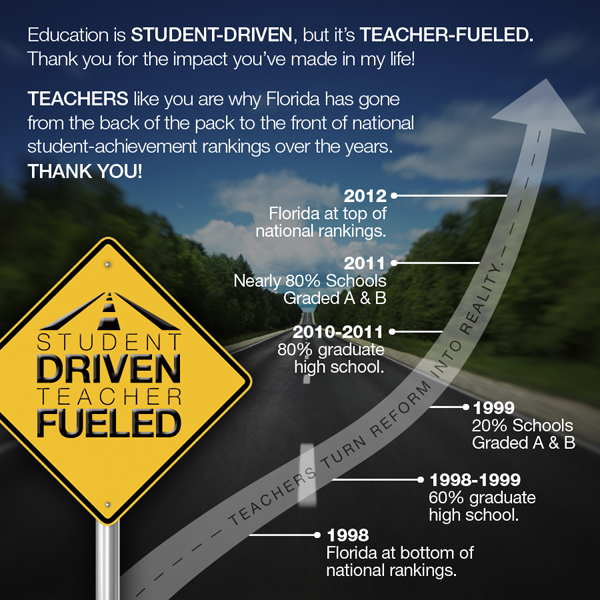 For more resources and ways to thank Florida’s teachers, visit www.excelined.org/thankyou. Sara Clements is a former Florida public school teacher and a member of the Foundation for Excellence in Education.